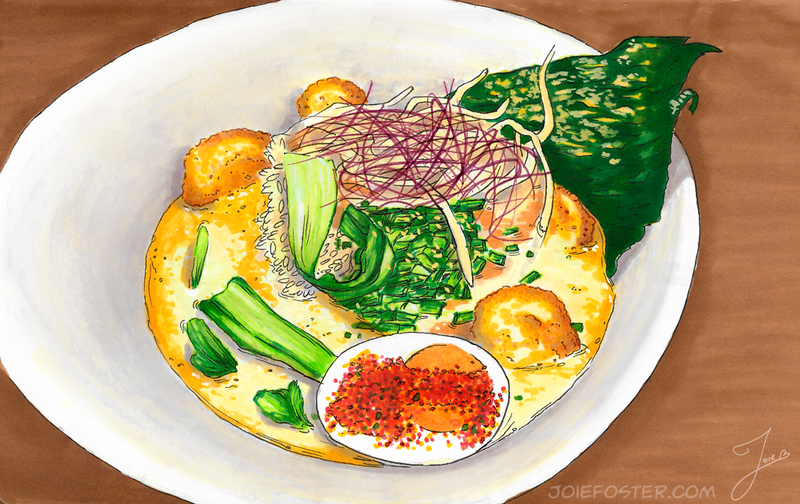 Vegan Ramen - Markers, ink, gouache. 8.5" x 5.5"
Like I said in my last post about Grand Central Market-- it's amazing and you have GOT to go if you're in the Los Angeles area! Seriously, call a Lyft or hop the train and get there right now. It's jam-packed with market stalls and restaurants that will take you on an epic food journey. Today's subject is the amazing Ramen Hood-- selected by us at random (ramen-dom, hah) because we were feelin' noodle-y. This place is a counter-based ramen joint, but it can be tough to get a seat at times. It's usually safest to order it "to go" so you can snag a seat elsewhere in the Market's open seating. Also if you're a beer-with-my-ramen type, you'll need to send one member of your party to fetch it from another stall while you order your food and then meet up somewhere in the middle. So I'm known for being pretty oblivious at times. I decided "Yes, ramen" and waltzed right up to the menu, scanning to try to find something with the least amount of FODMAP triggers* that they had. I somehow blatantly missed that this place was 100% vegan. Not only did I not realize it was vegan when I ordered, I somehow completely missed that what I was eating was vegan until I was halfway through it. Yeah, I'd agree that it rivals its non-vegan counterpart. As a matter of fact, their broth is a lot lighter than most pork-based broths, so I didn't feel like a disgusting, blorpy greaseball afterward! The thing that surprised me the most was the egg. And just what, pray tell, is a Vegan Egg?? What's it made from?! Clouds and smiles and fairy dreams? Whoa, ok, well there's my answer. See, there IS magic in it, I knew it. Honestly? I couldn't tell it wasn't an egg, especially when it was mixed in with all the other bright, umami flavors going on. There was something ever-so-slightly different about its yellow and white edges (Uncanny valley, anyone? ), but obviously not really enough for me to notice at first. Actually my entire recent purchase at the local art store was perfect because I filled out the yellow/orange gamut in my marker collection. Turns out a lot of food is yellow/orange. And green. Who knew? You know what colors you almost never use in food illustration? Purple and blue. Unless you're illustrating that Unicorn Monster from Starbucks. But I digress. Back to the food! What about those definitely-fried-meat-looking items in your illustration, you may ask? Being that the dish is vegan, one might assume that it's tofu... but one would be wrong. It's actually King Oyster Mushroom**, which has a surprisingly meat-like texture. It worked harmoniously with the dish, and was actually one of my favorite elements in it! So it took me forever to turn this illustration around, because life, stuff, and things. At the time, we had a side of Avocado Toast... which may have been the best I've ever had. Sadly, it no longer appears to be available. I get that they probably update their menu with the seasons, but darn it how can we irresponsibly spend all of our disposable income on avocado toast instead of buying houses and diamonds if we can't find any?! ;) Regardless I'm sure their current offerings of side dishes are all great, too. Anyway, in summary, whether you're vegan or not, if you like ramen, get thee to the Ramen Hood and eat everything you see there. *Ok, what is this FODMAP thing you keep mentioning in your posts? I'll do a proper post about it sometime, but it's basically different types of carbohydrates found in foods that can cause digestive problems for certain individuals. It's been researched by the Monash University in Australia, and is becoming more widely accepted as a way to prevent and reduce digestive stress. **But aren't mushrooms high FODMAP? How are you asking this question if you also asked the first question? Your Google Fu must be strong. But yes they are, and I am able to tolerate them. Different people have different trigger combinations, which is why it's important to do extensive testing with your GI doctor or a nutritionist. Starbucks UniFrappe: Liquid Unicorns or Liquid UniCant's? By now I'm sure there's no one left in the US who hasn't heard of Starbucks' newest drink, the Unicorn Frappucino. There have been tons of Instagram photos of it, articles discussing how the baristas are all definitely about to mutiny, Katy Perry spitting it out after one sip, and some woman telling her husband about her pregnancy with it. Prepare your retinas AND your taste buds to be seared! In my tiny corner of the internet, I am known as a Unicorn Lover (some might say "Expert"). I have unicorn art on my walls, unicorn soap, unicorn clothing, unicorn makeup brushes, and even a giant, hand-painted carousel unicorn in my living room. Of course I'd been tagged in posts about this upcoming drink approximately 8,437 times in the week leading up to the release. I had seen the ingredients list. I had extreme reservations at the idea of the "mango and sour" flavors it was going to have. But I persevered because how could I not? I am a Unicorn Lover. I prepared my pancreas by giving it a blanket, a hot tea, and lots of soothing affirmations. I also set up an Instagram Live event, because by golly, if I was gonna do this, I needed an audience! I wanted to order a Short. Really, I did. I did not WANT 33g of sugar floating in my bloodstream, or my pancreas turning to dust in a fit of frustration. But alas, Starbucks told me no. I was forced to get the Tall size, and, for the sake of the food illustration and full experience, I also got it with the dang whipped cream. It was a rather pretty, saturated confection with swirls of retina-searing magenta and blue. The cloud of whipped cream looked lovely with the pink, glittery sugar topping all of its white crests. Alas, it was supposed to also have blue powder, but I think my Starbucks decided I didn't need it in my life. Maybe that was a blessing in disguise at the end. I had to add the blue in the illustration on my own, for accuracy. So. I had an audience, an extremely, extremely brightly colored drink, and had prayed to the insulin gods. The first sip was an actual punch in the face. We're talking mouth puckering, eyes watering, absolute gag reflex. I had accidentally gotten a full mouth of just the blue sour syrup... and it had been several decades since the last time I'd had a Warhead candy. It caught me completely by surprise, and I had to take a moment to recover before I could continue. The pink part didn't really taste like mango-- it was more just... "fruit." Once I swirled some of the blue and pink together (and no, Hungry Readers, it did not color change), the sour and fruit worked together to make.... a new flavor. A flavor that wasn't bad. But it also wasn't good. I didn't completely hate it, but I also definitely did not want to drink the rest. I ended up having about half, but by this point I'd hit about 17g of sugar and I tapped out. I'm sort of offended, honestly. Here I am, a resident Unicorn Expert, and Starbucks didn't consult me on what unicorns taste like? I mean, they didn't consult Katy Perry either, but I digress. Unicorns do not taste like sour mangoes, or sour fruit of any sort. They taste like marshmallows. Maybe cotton candy (although I'm not a fan of that, personally). Perhaps they could even taste like white chocolate. But sour mangoes? No, sir, I don't like it. Here's my main takeaway: it was a fun promotion, and I'm glad I gave it a try. I got to do a nice illustration of it, and I don't have many reasons to bust out markers that are that bright, usually. As a matter of fact, I didn't have all the shades I needed in that level of brightness, so I did have to do a bit of digital work after I scanned the original. Perhaps some may say that us mere mortals can't fully appreciate the taste of unicorns, but I for one think that's not the issue. I believe we mortals can't possibly imitate the magic that is unicorns. We shot for the moon and landed... I dunno, somewhere in west Jersey? If you also want to have a sugar rush and then a headache afterward, make sure to get your drink by this Sunday when the promotion ends! Hello passengers, my name is Joie and I'm your tour guide today on our Sugar Safari! We're out to spot some colorful confections today, so keep your seatbelts buckled, your insulin ready, and your peepers peeled! And remember, no flash photography as these desserts are wild and dangerous. And here's our first cupcake now, just off to your left. Chocolate cakes can come in many shapes and sizes, but this one is especially majestic in that its chocolate icing has been salted! The salt decoration is the meager beginnings of what will become a lovely mating display later this season. Chocolates have some of the highest populations here, and tend to be found grouped up with Vanillas. Ah! Quick, grab your cameras folks-- this lovely syrup watering hole up ahead has a visiting pack of Strawberries. Look at that one, she's a beaut! Perfectly fluffy white buttercream icing, glossy berries, and a lovely polka dot wrapper. Great specimen, that one! This area is well known for its citrusy cakes, and this Lime is no different! Its lime crest buried in the cream cheese frosting denotes its rank within the group. This one is especially powerful, and may even be the Alpha. Sir? Sir, I need you to get Little Timmy to pull his arms back inside the vehicle-- we don't want to challenge the KEY Lime in a battle of dominance! Quiet now, folks. Here we've come upon some cakes hunting. Food is sometimes in high demand without enough to go around, and it appears that the Confettis are closing in on a herd of sprinkles-- which are cakes' favorite prey. Sprinkles are incredibly difficult to catch because of their agility, so a cake pack has to work together seamlessly to feed themselves. Watch the way that the Confettis use their colorful appearance to hide in the tall grass. Waiting. Watching. Oh gosh, what's this?! A Velvet interloper has entered the scene! Seeing a Velvet on its own is fairly rare; he must've been an old Red that got usurped by a more powerful one and driven away from his pack. He's looking quite lean on sprinkles, which is likely what's driven him to just run at the sprinkle herd without a plan. Desperate times call for desperate measures! The Confettis don't look happy about this at all-- the sprinkles have been alerted to danger and have wisened up. Looks like no one will be getting dinner tonight. And what's this? Oh, oh my. Here we have the completed the circle of life-- just off to the right. It appears that a juvenile Black Forest cake may have strayed too far from his group. The world is a dangerous place, and rogue Forks can be anywhere! From the stab marks in the ground here, I would guess it was a group of no less than three that found the Forest by himself. Let's be honest, "Gone" really IS the most common type of cupcake. Well, that concludes our Sugar Safari for the day, ladies and gentlemen! We are back in the safety of the Visitor Center, so please make sure you have all your belongings before exiting the vehicle. Thank you for going wild cake spotting with me today, and be sure to check out the gift shop on your way out! See you next time! Be sure you've tasted course one, two and three before moving on to this one! So at this point in the meal, I've noticed a trend. Each dish has a stronger flavor and heavier consistency; they play upon the tasty notes that have already been established, and are definitely ramping up to a crescendo. We've got a Flavor Symphony, here! Is this how all meals are meant to be? Is this real life? This illustration was particularly challenging because of the delicate veins in the turnips-- they're so subtle that I had to be careful not to overdo it. Next will be course five of the chef tasting, in which we go full tilt flavor! *I used to hate hot sauce, but I'm slowly becoming a lover. I'm pretty sure this was a house sriracha, and it was DELIGHTFUL. As a working artist, I have to exhibit at comic and art conventions in order to grow my audience, sell my wares, and meet art directors. Each show requires a ton of prep work, and then a certain amount of recovery time afterward as well. This show was totally food related though, as I just debuted my very first set of food illo art prints and pins! Deliciousness for your wall or photo frame! If you missed WonderCon and were interested in getting your hands on these prints or the accompanying pins, stay tuned: I'll be opening a web store soon! If you want to stay up to date on the things I get up to as an artist, sign up for my newsletter. It's a weekly "open diary" on what it's like to be an artist, what new work I have, upcoming shows, and (eventually) coupon codes for the store! You see that fish there? It's so soft that it's like eating straight butter. Oh yeah. And we're back with the amazing Course Three in my Kato Chef Tasting Experience. Be sure to read parts One and Two first! I suspect that's also why they don't serve any alcohol, and their drink selection is extremely limited. Green tea or sparkling water work just fine when alcohol could detract from your enjoyment of the delicate flavors they're putting in your face. Plus, realtalk, as a restaurant owner I bet it's just easier to get through life when you don't have to worry about booze permits. So! The delightful third course of the evening was trout with chili and seared cabbage. This dish, seriously. UNG. I almost died when I put it in my mouth. The trout was cooked in a sous vide so it actually burst apart as soon as it left my fork, and the amazing flavors locked inside are the kind you'd write home to mom about. Or... write about on a blog on the internet. The chili sauce is apparently fermented, and while it has a dash of heat, it uses it subtly to enhance the other flavors. The seared cabbage* is crisp and its strong flavor sticks with you long after this course is over, but in a good way. Stay tuned for Course 4! "How many courses ARE there?" you ask. The answer is five, plus dessert, plus additional food we ordered at the end to round everything out. In other words, I've got a lot of drawing to do. * I am definitely not supposed to eat cabbage. That's that FODMAP thing again that I mentioned before. I'll get around to discussing it, one day. I ate it anyway though, in the name of art! Lemony Snake-it's "Series of Unfortunate(ly Empty Cuz I Drank Them) Drinks"
I went to Trader Sam's Enchanted Tiki Room at Disneyland recently, and ordered this delightful drink called The Passionate Python. "Ah," you say, "NOW I get the joke in the caption." Well ssssspotted, Hungry Reader! This drink is described in the menu as "Dark and Aged Rums, Red Passion Fruit and Tropical Juices garnished with an Orange Peel 'Python.'" This particular illustration was an exercise in playing with layering techniques. 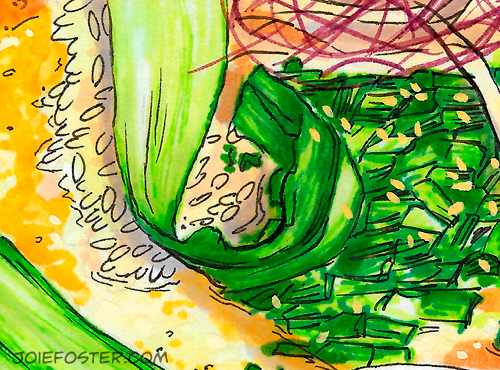 I don't like going straight into a piece with my most vibrant marker-- no no! I'd rather layer a saturated color over a less saturated base to keep the color from becoming unnatural (not... that the color of this drink was natural, but I digress). To achieve this bright red orange without going overboard, I first put down a layer of Goldenrod (PM-69), put Poppy Red (PM-13) on top, and then finished it with hits of Scarlet Lake (PM-5). "But what about that ghostly lemon peel and the straws in there?" you wonder. There are clearly no pen lines, so how did I do that? I'll tell you in Parseltongue: Ssssssssssss sssssssssasaaasss sassssssssss shhhh sssssss! *Note to self and others: Do not attempt to Marker while drinking the subject of this illustration. The results won't go well! Please Marker responsibly. Welcome back, hungry reader! This is the second post in a series about my Chef Tasting experience at Kato Restaurant in Santa Monica. If you haven't yet, be sure to read Part One first! Kato is a restaurant that specializes in Chef's Tastings, and is a Californian/Japanese/Taiwanese hybrid. And no, Chef Tasting doesn't meant we ate the chef, in case you were wondering. Kato itself is hidden in the corner of a strip mall in Santa Monica-- it can actually be quite difficult to spot until you're practically standing on top of it. One might even call it a Room of Requirement-- it's impossible to find unless you're desperate for tasty, well-crafted food. The dining room is terrifically small, so you MUST make reservations... and make them, like, a week out because this place is very popular. So on to our second course, which was hamachi and cucumber topped with a charred scallion sauce. What are the herbs on top? I'm not entirely sure, as I'm not good at identifying these things by sight yet. * Fennel? Maybe? The dish's flavors were gentle, cool, and seemed slightly pickled. This made an excellent pair against the good punch in the mouth that the charred/smoky flavor of the sauce gave you! Stay tuned for the 3rd Course coming soon! *I'm learning, I swear. At least, it's on my "To Learn" list. So I'll get around to it. No really! Last month we tried out a highly rated restaurant in Santa Monica named Kato, a Californian/Japanese/Taiwanese hybrid chef's tasting restaurant. Hungry Reader, you may be asking "Um wat?" which is the exact same question I asked myself because I, too, think in memespeak. Luckily for you, I went and found out! A chef tasting is when a restaurant's chef designs a menu that takes customers on what I like to call a food experience. A Foodsperience, if you will. The flavors of each small course are meant to work together like a team to send you to Tasty Town. It began with what's called an amuse bouche, which is sort of like an appetizer but smaller. It literally means "to amuse your mouth." It was a tapioca snack with roe (fish eggs), and while it was brownie-like, was also very salty. Think "sea salt brownie with heavy emphasis on the sea and possibly as dark as it is because maybe squid ink?" Regardless, it was delightful and I was ready for more! We then received our first course, which was tuna tartare with eggplant and herbs over crispy rice. Seriously I put this thing in my mouth and the world stopped*. The rice gave it a fantastic crunchy texture that contrasted with the softness of the tuna. The vinaigrette had almost a minty note to it, and the shallots gave the sauce absolute sass. SASS, I say! The dish was very light overall, which, by the end of the meal I learned is the best way to start a Foodsperience so you can build a flavor symphony over time. But more on that next time with Course 2! So my husband and I moved last fall, and in our old neighborhood we had an amazing sushi place. It was so good that we went about once a week. We always lamented though, "Gosh, we really wish we had a good Mexican place around here." Lo and behold, our new neighborhood has a dearth of sushi (sigh), but has the exact sort of Mexican place we asked for: Fiesta Martin at 1330 N La Brea. We've been here quite a few times, and the atmosphere is warm and inviting. The service can be a little slow, but it never lacks for friendliness. I think we've had the exact same waiter every time, and this dude is just the nicest. Is he the Martin that likes to Fiesta? I can't say. A repeat dish I've ordered is the mojarro frita , which is an entire tilapia, deep-fried. Yes, with the head on. It's crispy, light, and is seasoned well. There are also plenty of things that are more traditional like the Milanesa (A+! ), and then some truly this-is-a-bad-idea-but-it-looks-so-good dishes such as the Camarones Costa Azul (A+ for clogging ones' arteries!). The drink menu is staggering as well-- they've got standard margaritas, and then complex, frankly ridiculous-looking cocktails that feature sidecars and upside down beer bottles that seem to defy the laws of gravity. My favorite drink, however, is called the Cantarito and it originates from Jalisco, Mexico. It's served in a clay pot, has tequila, grapefruit soda, various fruit juices, and then has bits of fruit floating on the top. Plus, the drink is less than $8. As a previous graduate student, that is the perfect price to get a bit fancy, especially here in Los Angeles. So is the food good? 4 out of 5 tacos! It's LA, what's the parking like? Meh, there's a tiny parking lot out back, and some street parking in the surrounding neighborhood. Is it QUIET? No, but especially no when there's some sportsball game going on. Final verdict: YUM. Fiesta on, Martin. Fiesta on. *No, I don't hate onions. I actually rather like them, but I have to keep my diet fairly low FODMAP, which I will get into at a later date on this blog. Feel free to Google it now if you like though. Go on, you know you're curious.